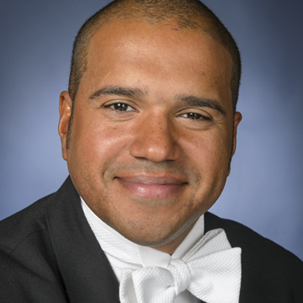 Dr. Armand Hall is a conductor and educator dedicated to the creation of new music in all venues. From 2012 – 2018 he served as assistant professor and associate director of bands at the University of Memphis. There he conducted the symphonic band, the marching band, and taught courses in music education. From 2002-10, Dr. Hall served as director of bands at Dunckel Middle School and, from 2003-09, assistant director of the North Farmington High School “Raider” Marching Band in Farmington Hills, Michigan. He earned his Doctorate of Music Arts in wind conducting at Michigan State University with Dr. Kevin Sedatole, and Master of Music and Bachelor of Music degrees in music education from the University of Michigan, Ann Arbor. Dr. Hall is active as a commissioner of music, having commissioned instrumental music for beginning through advanced ensembles. Dedicated to teaching, he is the educational director and teaching artist for the Archipelago Project, a non-profit organization charged with engaging students in music and their instruments by teaching multiple folk idioms using pedagogical techniques based on the Venezuelan El Sistema model. With the Archipelago Project, he has traveled throughout the country and Venezuela teaching music students and performing for their communities. Additionally, he is a board of directors member for the PRIZM Ensemble in Memphis, Tennessee. Dr. Hall is also active as an adjudicator and clinician; and is a member of the College Band Directors National Association, National Association for Music Education, College Music Society, Michigan School Band and Orchestra Association, Phi Mu Alpha Sinfonia Fraternity of America, and Kappa Kappa Psi National Honorary Band Fraternity.